Cénomanien (100,5 - 93,9 I, is a duration of 6,6 My, according to the international charter of 2012) is a particularly informed floor because it corresponds to a rise eustatique remarkable, maybe the highest of all times geological. Seas épicontinentales are very widely developed and settle pelagic carbonated muds and hémipélagiques there. Cénomanien can be considered as a big transgressive phase, punctuated by several regressive episodes of more short duration and lesser amplitude. The sequential stratigraphy (Robaszynski and al ., on 1998; Wilmsen, on 2003) recognizes generally 6 sequences of deposit (DDS), of a duration of the order of a million years. 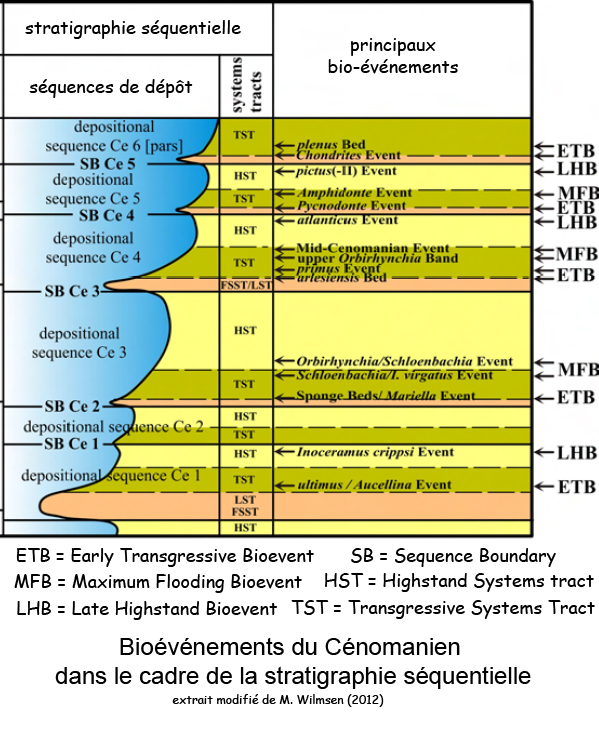 Towards the end of Cénomanien occurs the anoxic oceanic event OAE2 in the course of which the oceans become impoverished in oxygen and a big quantity of organic matter is held in deep sediments (black shales). The up-wellings of these waters sub-oxygenated on platforms are going to lead the disappearance about 27 % of the marine kinds. An excursion is positive of d13C mark this event (the organic matter grows rich preferentially in this isotope). The phenomena on platforms are more complex. The concomitant rise of the marine level in the limit C/T (Cénomanien / Turonien) is one of stronger registered. A poverty in fauna benthique. 2) Reduction of her pCO2 Of the atmosphere and the greenhouse effect which is attached to him, rough cooling was showed by him d18O and by extinctions of biological sorts and the changes of type of fauna at the beginning of Turonien. 3) Volcanic degassing, increase of the greenhouse effect, the rise of the level of the seas of 20 m, oceanic anoxia and increase of d13C. The anomaly osmium (Turgeon and Creaser, on 2008) ) in the coats of Furio (Italy) and the drilling ODP 1260B, contemporary of the training of the Caribbean plate would indicate that deep volcanism mantellique would be responsible for this anoxic period. Another event marks the environment of Cénomanien, referenced MCE1 or Mid-Cenomanian Event 1 " hypothetical equivalent and in a lesser scale of the AOE2. He begins on the verge of zones in C. Inerme And T. costatus and marks by a low diminution of d13C followed by an increase of the order of 0,5 ° / °°. A double oscillation affects the level eustatique (Hancock, on 2003), with 2 minima, the one MCE1a in the zone in Costatus (Primus event), other MCE1b in the base of the zone in acutus. Globally, the transgression cénomanienne peaks in the third superior of upper Cénomanien (at the end of the zone to Calycoceras guerangeri-naviculare). 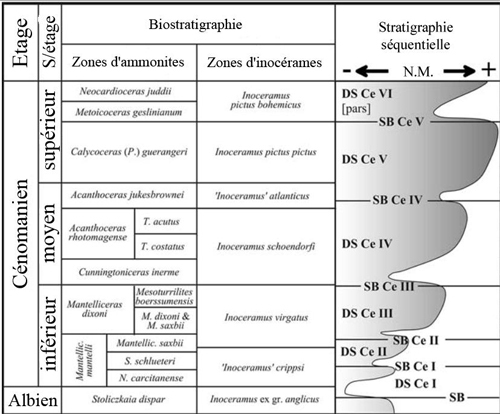 The stratigraphy of Cénomanien of the Country of Callus is established well (Juignet, on 1974; Owen, on 1996; Amédro and Robaszynski, on 2001)), mainly by its macrofauna of ammonites and of inocérames. Cliffs between Havre and Etretat (valleuse of Antiiron) cover the set of the floor; in the Course Fagnet (FFécamp) only the terminal part appears in the base of the cliff. Compared with the classic cups (Isle of Wight, Beachy Head, Folkstone, White-nose), Cénomanien du Bec-de-Caux possesses a reduced thickness (between 40 and 50 m), resulting from a rate of lower sedimentation (less thick stanzae) but especially from episodic condensations underlined by hard-grounds. Flints establish the peculiarity sédimentologique the most typical of this region; the top of the elementary sequences is almost systematically concerned by such a transformation diagénétique. Flints appear more prematurely in the Beak of Callus than in England. The sedimentary area is considered as a high zone, weakly subsidente, outside an emerged Armorican massif. 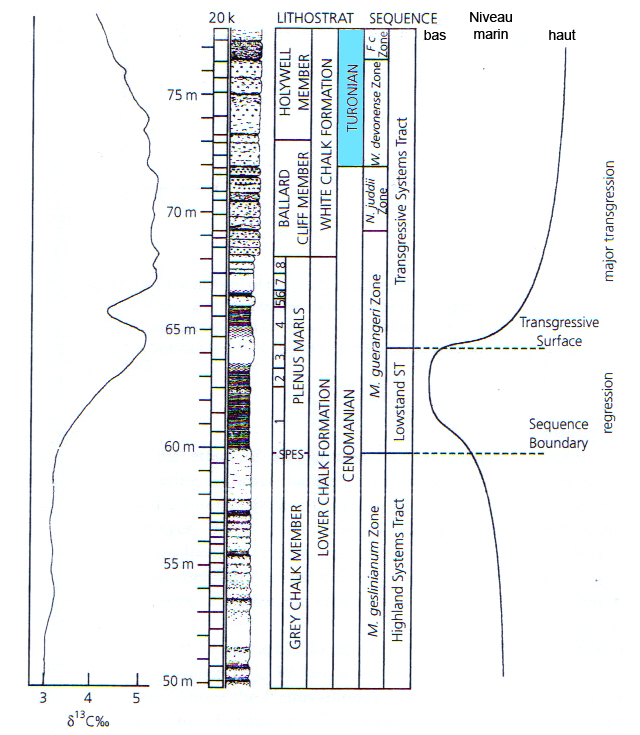 For the following descriptions, the sequential stratigraphy supplies the main pattern. A cutting in more high-resolution is brought by the factual stratigraphy. The cyclostratigraphie is applicable, apparently. But because of recurring hiatuses, the wedging with stanzae defined in England remains at the moment problematic. The subdivisions adopted are the ones of Robaszynski and al. (1998). They understand 5 sequence and the bottom of the sixth, Ce1 to Ce6. Wilmsen (2003) also recognizes in Lower Saxony the same cutting with for notation SB Ce I to VI.